The Power of Summer is an outdoor cinema by Everyman Cinema, open all summer long at London's iconic Battersea Power Station. We were commissioned to create the branding and handpaint all onsite signage. We designed all aspects of the branding from the logo, posters, postcards and web graphics to the onsite signage, wristbands and T-shirts. It was a great opportunity to see the visuals roll out across every element of the event to give the same fresh colourful design throughout. Considering the location was really important to the design process, we were keen to make sure that it felt in keeping with the bold, industrial landscape as well as conveying summer fun. 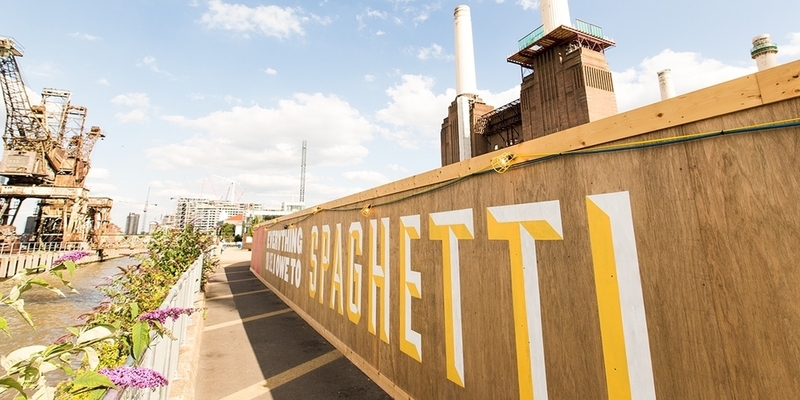 "Bread has previous experience when it comes to large scale design work that packs a personality-filled punch and it’s great to see them unleash their talents on such a famous landmark. The bright and lively visuals juxtapose neatly with their industrial surroundings and there’s a consistency that ties the site together without feeling sterile." As part of the project we hand painted a 150m hoarding leading to the event site. With a tight deadline we were lucky to have a great team on board to help with the daunting task. 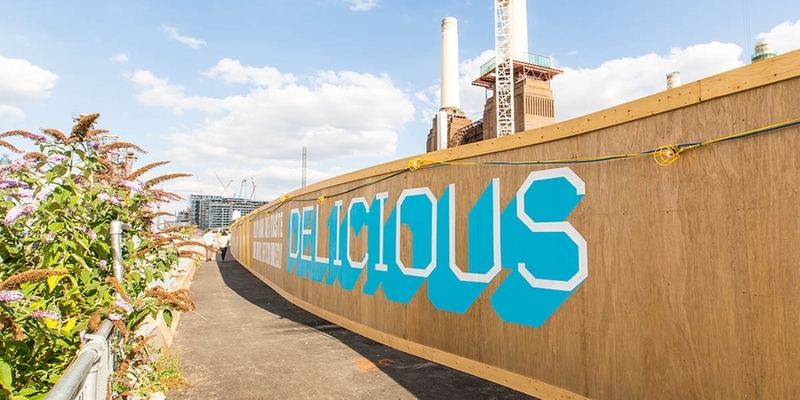 Leaving the raw wood of the hoarding visible under the design gave a more industrial and less glossy feel, which we felt fit in well with the local surroundings. We went through various design stages working closely with Everyman to achieve the final outcome, which was based on a series of quotes from well known icons. It was great to work with our client Everyman Cinemas who provided a great film list and the vision for the event, and we also really enjoyed the opportunity to work with the amazing Paddy Austin of Cities Ideal (site design) and the fantastic team at Helix 3D (site build).